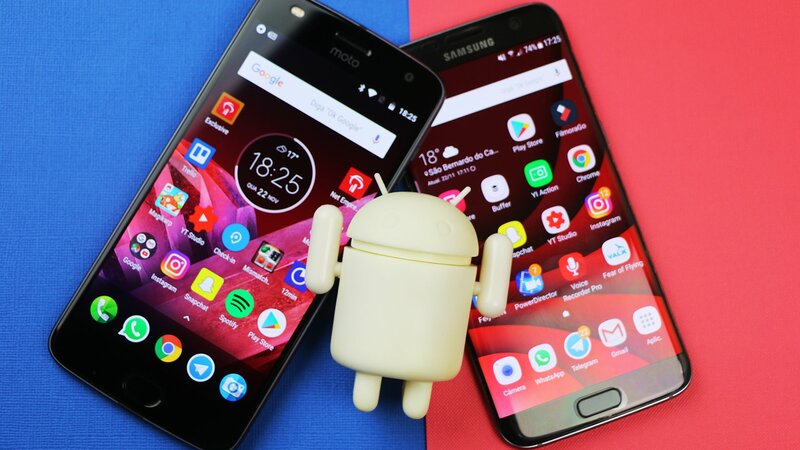 8 Galaxy S7 Edge vs. Moto Z2 Play Space: A pure system or not? 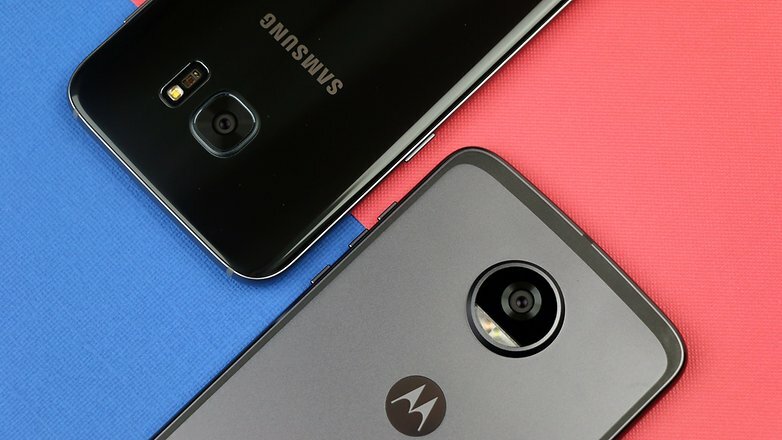 9 Galaxy S7 Edge vs. Moto Z2 Play: Which is a better choice for you? A top-of-the-line from last year or a mid-range from this year? Both are attractive options for the savvy shopper. With the Galaxy S7 Edge and Moto Z2 Play in hand, I’ll break down the similarities and differences so you can make the right choice. The difference in design between these two models is night and day, but neither of them is ugly. The build of each model plays a big part because it will dictate which you like based on the design. The Galaxy S7 Edge is beautiful, thin and elegant. It’s much better looking than its brother the standard Galaxy S7. It comes with that famous Edge display, with long curves down the sides that give it a smaller and slimmer feel. The backside is entirely made up of glass. The borders aren’t just easy on the eyes either, they’re actually useful. They have exclusive apps and features that have direct access to notifications when the screen is off. 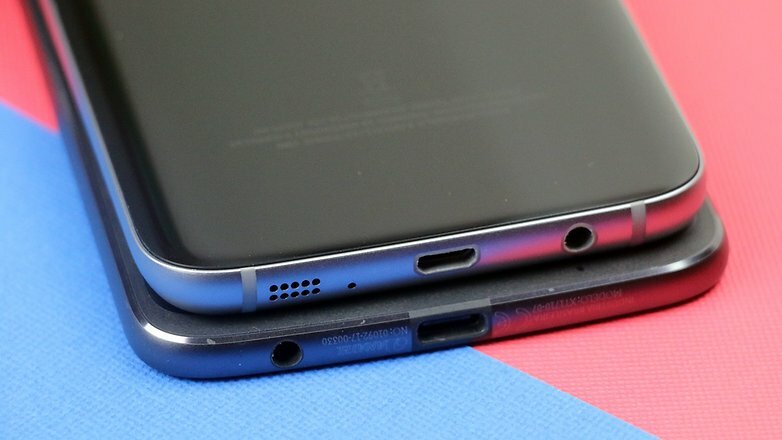 The fingerprint sensor is on the front. Although it does have quite a bit of a bezel on the top and bottom, on the sides, it’s pretty much nonexistent. However, this does end up harming the ease of use since you can easily touch things without meaning to. The Moto Z2 Play has a more practical, modern and stripped-down look. It feels solid in your hand, and even though there isn’t much difference in size compared to the S7 Edge, it just looks bigger. The fingerprint sensor is on the front as well, and on the back, the finish is metal with a camera that sticks out quite a lot. That lump on the back is actually there for a reason. The Z2 Play supports Moto Mods, modular snap-on accessories that connect using magnets on the backside of the device. They can come with different features like a speaker, projector, gamepad, 360º camera, extra batteries and a lot more. Once again, the design comes into play here, because although they both have 5.5-inch displays, the Moto Z2 Play seems bigger. Apart from that, as I said above, the screen on the S7 Edge is less user-friendly, but it is better looking, and it comes with more features. They both have similar displays with Super AMOLED technology since that’s something that more advanced users are looking for. Comparatively, it’s worth it to mention that the colors on the Moto Z2 Play are more balanced, whereas the S7 Edge tends towards slightly bluer hues, but that can be tweaked in the settings menu. The screen on the Moto Z2 Play seems to be slightly more intense, but if you’re not looking at it straight on, the colors are bit fuzzier than those on the S7 Edge, which maintains excellent definition in that aspect. Both are protected by Gorilla Glass, but the S7 Edge has version 4, where the Z2 Play comes with version 3. Another difference between them is that the S7 Edge is Quad HD while the Z2 Play is Full HD. To the naked eye, this doesn’t really mean much, but it does make a difference when you look up how much area each one uses. In this, the S7 Edge comes out ahead. This is the exact reason that we’re comparing a top-of-the-line from 2016 with a mid-range model from 2017. From one year to another, components evolve, and mid-range devices can hold their own against the hardware of last year’s top models. You can take a look at the specs below, but what we’ve got here is a battle between an Exynos 8890 against a Snapdragon 626. Both with 4GB of RAM which makes this a very even contest. Either device can handle practically anything you throw at it. We already know that hardware on mid-range models is good enough to compete with high-end models in a lot of different categories, and this is even more evident when it’s compared to last year’s model. They may not be able to run the most demanding games out there, but they’ll do just fine with any other task you can think of. The Moto Z2 Play is dual SIM, with slots for two chips, whereas the Galaxy S7 Edge is, unfortunately, just a single SIM. The cameras are also quite a bit different. Although they both have 12MP cameras with f/1.7 aperture on the back, the S7 Edge has the advantage in quality as it has much better post-processing. Not that the photos on the Z2 Play are bad, they’re actually quite good. But the S7 Edge takes excellent pictures, easily better than a lot of phones launched this year. They both have autofocus with face recognition, but the Z2 Play has dual flash, and the S7 Edge comes with optical stabilizers. They both can take 4K or Full HD videos with up to 60fps, but the slow-motion camera on the S7 Edge can take up to 240fps whereas the Z2 Play can only take up to 120fps, both in HD. Both front cameras are 5 MP, but the S7 Edge has an aperture of f/1.7 against f/2.2 on the Z2 Play. So, as we can easily see, the camera on the S7 Edge once again, comes out on top. This aspect, which is very important to all users, is well done on both devices. They aren’t incredible, but in the hands of less demanding users, they should last throughout the day or even more. The Moto Z2 Play was under scrutiny for having a smaller battery than its predecessor, Moto Z Play, which was a massive success in this category. However, with 3000 mAh, it lasted up to 36 hours with normal use which included an hour of gameplay, two hours of WhatsApp, half an hour of video and an hour of Facebook, among a few other things. With the same use, the S7 Edge and its 3600 mAh battery last about the same amount of time. It uses a bit more energy because of its more demanding and year-old processor, but it can easily handle a full workday. The advantage on this one goes to the Moto Z2 Play since it comes with a Turbo charger and in just a few minutes you can have up to 3 more hours of battery life. Plus, it also has the Moto Mods battery option, which adds up to 2200 mAh to the total. 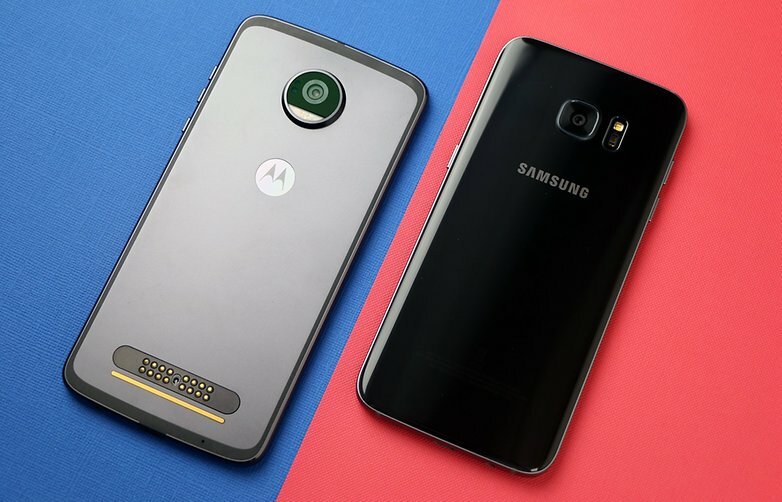 Galaxy S7 Edge vs. Moto Z2 Play Space: A pure system or not? If space is something that’s important to you, you’ll have plenty of it with these models. The Moto Z2 Play has 64GB, and there are about 48.5GB for you to play with. It doesn’t have the hybrid slot like the Z, but you can have a dual chip and use a microSD card of up to 2TB. The Galaxy S7 Edge has a microSD slot as well since it’s a single SIM device, and you can add up to 2TB of space as well. 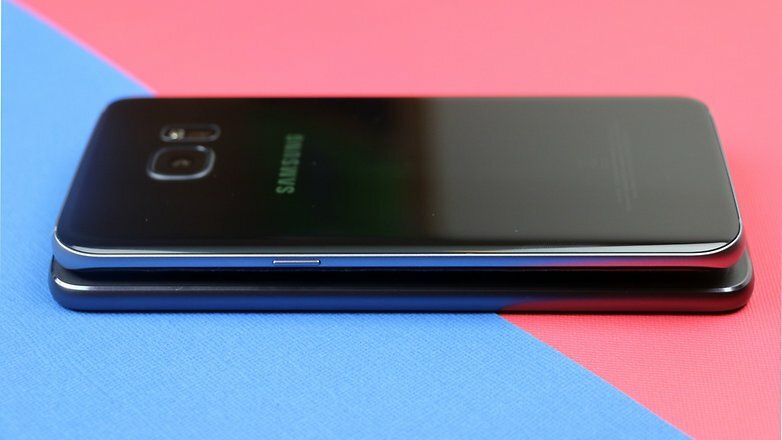 One significant advantage here is that there are currently 128GB versions of the S7 on the market, which is more than enough for almost any user. The Z2 Play brings with it Motorola’s fame of putting the purest version of Android possible on their devices. And, although that is the case here, Motorola still adds some extras like the Moto App. With that app, all you need to do is shake your device to activate the camera or flashlight. You can even see relevant info when you tap on the display or wave your hand over it, among other features. They’re really cool features, and the system is fluid and light, without being too flashy. The S7 Edge has TouchWiz, which is Samsung’s modified version of Android. It’s already been heavily criticized, but it’s starting to become cleaner and lighter, as is the case on this device. It’s still full of features, and so it’s perfect for someone who likes to personalize as much as they can on their devices. 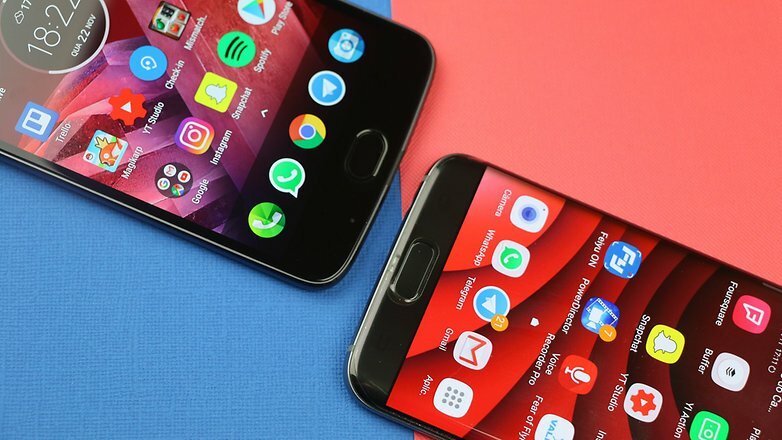 TouchWiz is heavier than the Moto App, and it demands a bit more from the processor, but since this device is top-of-the-line, that shouldn’t be a problem. The features on the S7 Edge are really nice and comprehensive, giving users the ability to tinker with a lot of different aspects. No need to worry either, both will be updated to Android Oreo 8.0. However, they probably won’t go past it. 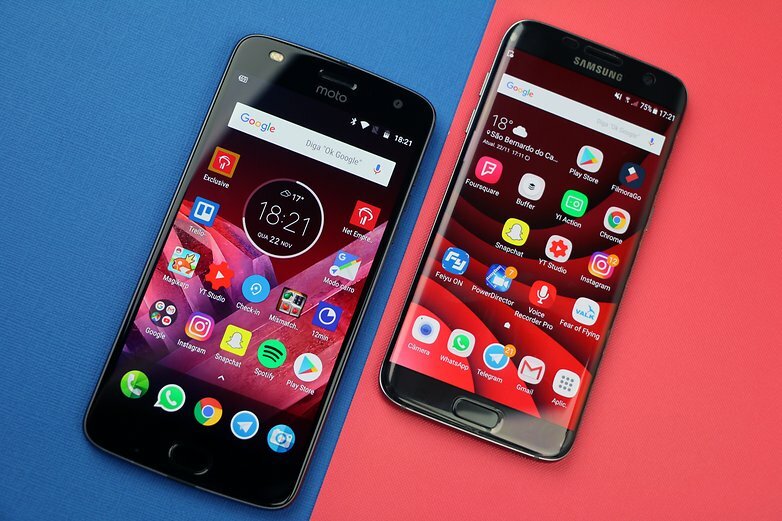 Galaxy S7 Edge vs. Moto Z2 Play: Which is a better choice for you? Display: they both come with solid displays that are practically identical. Hardware: even though one is top-of-the-line, it’s from last year. Whereas the other is from this year, but it’s a mid-range model. This evens it all out, and the only difference here is if you’re looking for a dual SIM device, then Z2 Play is the one for you. Camera: The S7 Edge takes this one. That doesn’t mean the Z2 Play is bad, it’s just that the Samsung device is a lot better and it will please anyone looking to take high-quality photos. Pictures on the Z2 Play won’t have any problems on social media, and they both come with manual controls. Battery: Both can last for more than a day if users aren’t too demanding. With heavier use, you can get up to 18 hours out of them, which really is a decent number. System: a purer and lighter Android with fewer features or a more modified version with more features and personalization? That’s something that only you can answer.